[OSEN=표재민 기자] G-DRAGON squirmed when he heard that his team ended up becoming the first team to go up on the stage at Infinite Challenge’s song festival. On the August 8 episode of Infinite Challenge, TAEYANG and Kwanghee couldn’t answer the quiz questions correctly, and their team was made to go first on the stage at the song festival. G-DRAGON was not with them since he had to shoot a music video, and TAEYANG was uncomfortable about telling him the news. 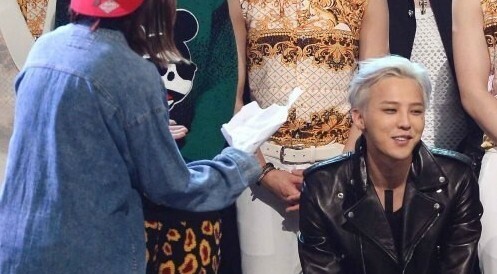 As expected, upon hearing the news, G-DRAGON sighed and said, “What’s wrong with you guys today.” He added jokingly, “Confetti on the first stage does not look good.” Confetti was chosen as the stage effect for their performance. Meanwhile, the August 8 episode of Infinite Challenge was the sixth special episode for the show’s Song Festival. On the episode, the order of performances was decided and the six teams started recording their songs. [Kim Jae-won’s B-cut file] G-DRAGON a rascal or a gentleman?